Subject of some recent modernsation, this one bedroom Apartment situated on the 1st floor is bright and airy and has a lovely sunny balcony with sea views. The spacious lounge area consists of a large L shaped sofa, a television and a mini hi-fi system. There are French doors leading from the lounge to the sunny balcony with lovely pool and sea views. The new and modern kitchen has a 4-ring hob, microwave and fridge. There is dining room table and 4 chairs. In the bedroom there is a double bed, a chest of drawers and fitted wardrobes. In the bathroom there is a circular bath with shower. There is a safe in the Apartment. The main entrance to the Apartment has steps leading up to the front door. Sand Club is a very quiet complex although a further attraction and one which makes this complex so popular, is that it is just around the corner from the main shopping area and all it's bars and restaurants. Many with nightly entertainment. It is also close to the golf course making it an ideal location for golfers. Adult Swimming Pool, Children's Swimming Pool. 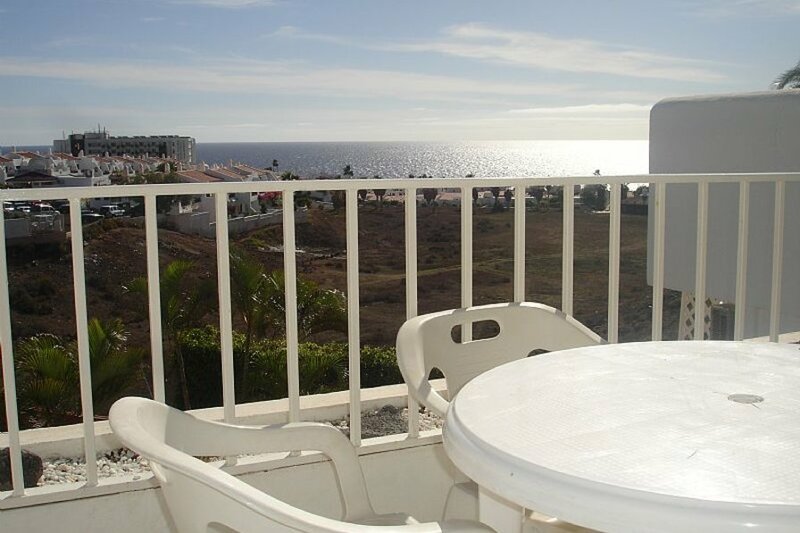 10-15 minutes from Airport, 15 minutes to Los Cristianos and Playa de Las Americas (by car). A welcome pack can be provided for your arrival. Towels and linen change weekly. This apartment is looked after by a local management company whose contact details will be sent to you when you book. Many people book these apartments, reassured in the knowledge that they are close by. Lovely sunny terrace overlooking the pool and wth lovely sea views.